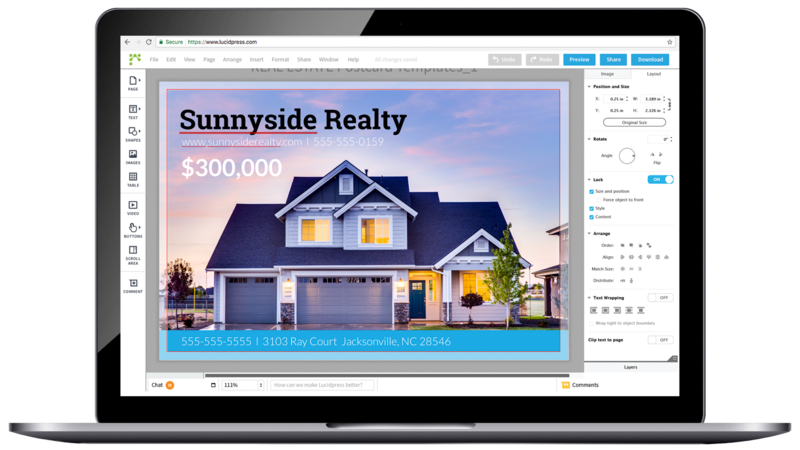 Real Estate Marketing Software | Lucidpress . ', failHtml: "
Empower your agents (and anyone else) to pump out customized collateral without going off brand. Managing a brokerage has its share of stressors. 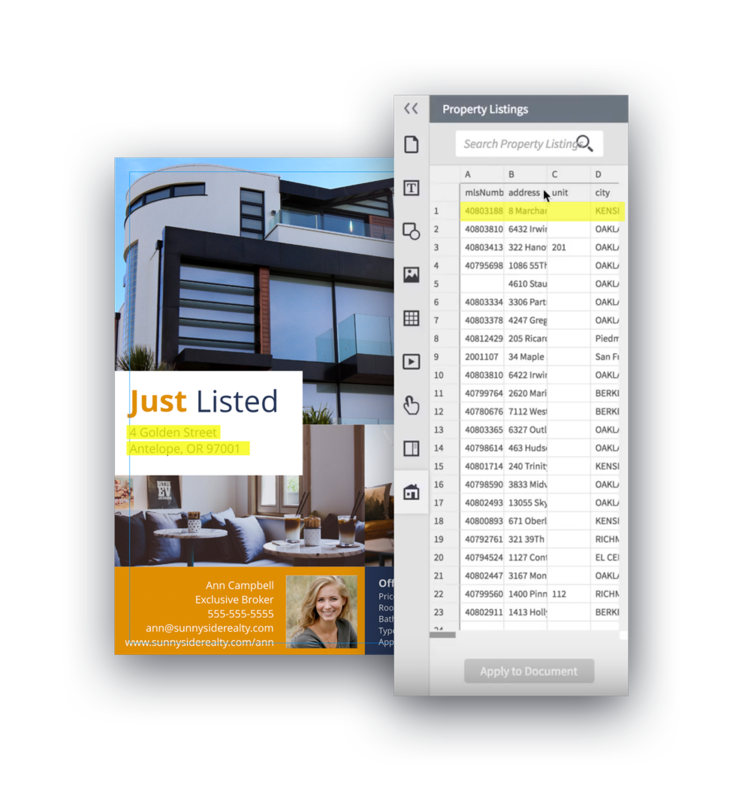 On top of making sure your brand stays consistent in the hands of dozens of agents, you also have dozens of personal preferences to try and keep satisfied. And sometimes there simply isn't enough time or resources to master both. The result? Off-brand, amateur collateral becomes widespread — damaging your brokerage's image and leaving agents screaming for a solution that keeps you off their back. That's where Lucidpress comes in. Lucidpress empowers your entire organization to stay on brand without slowing them down or taking away their creative preferences. That way, you can (finally) keep both your agents and your brand happy at the same time. Gone are the days when slapping on a logo was enough. 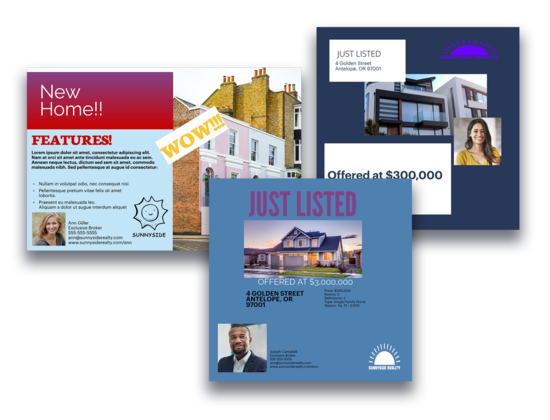 To keep your agents satisfied, real estate software should enable them to create content that's also interesting and personalized. While other template solutions exist, they can be inflexible and slow. Uploading new templates can take weeks at a time, at which point agents are still unhappy with the platform's stiff and limited capacity. 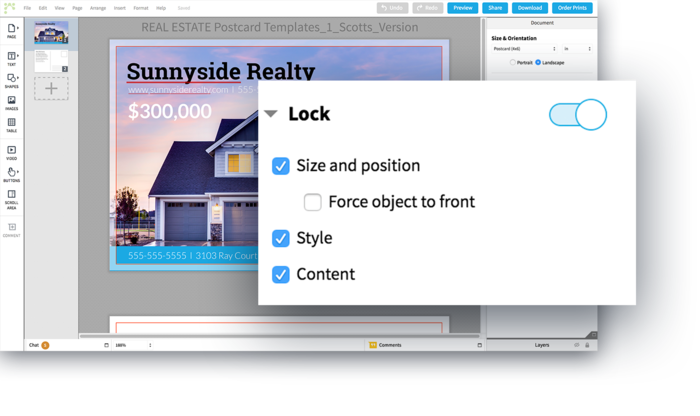 Lucidpress' simple drag-and-drop interface allows agents to make (on brand) adjustments to templates in minutes. Your agents are real estate professionals, not necessarily accomplished designers. Say goodbye to stretched logos and off-hue colors forever by locking down logos, fonts, images, colors, and more. Our template solution allows agents to create co-branded, professional designs that represent their personal style without going off brand. 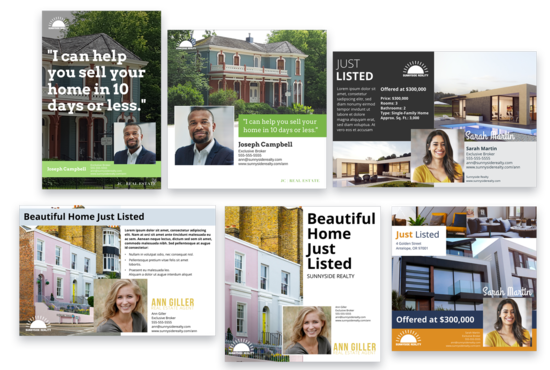 Realtors can customize and distribute pre-approved templates on their own, freeing up precious design resources for the central team while still ensuring brand consistency. 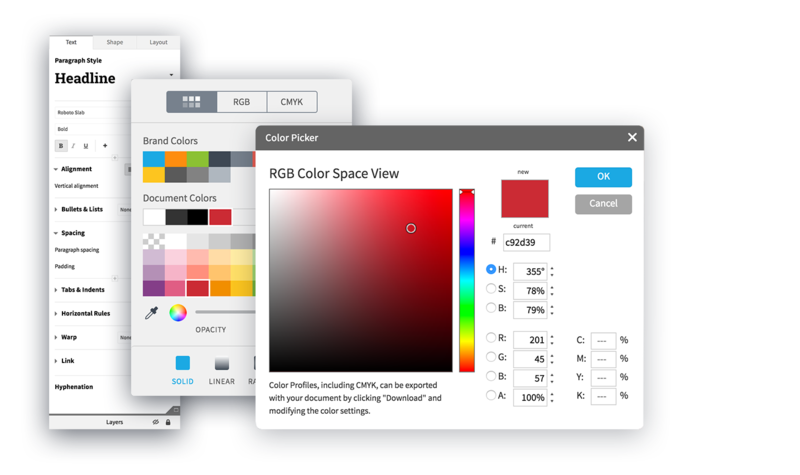 Agents will only be able to customize the design elements you determine. The rest will stay locked down and beautifully on brand. Consistent brands are 3-4x more likely to receive visibility. You'll save your brand (and your business) from an identity crisis by staying consistent in the eyes of prospects and clients. Lucidpress is a brand marketing automation platform that allows you to automatically import data (such as property or contact information) into your designs. Smart fields, as well as our Real Estate Data Import (REDI) feature, make this possible. Save yourself time and hassle by letting Lucidpress automate those tedious tasks. No more third party mail services. 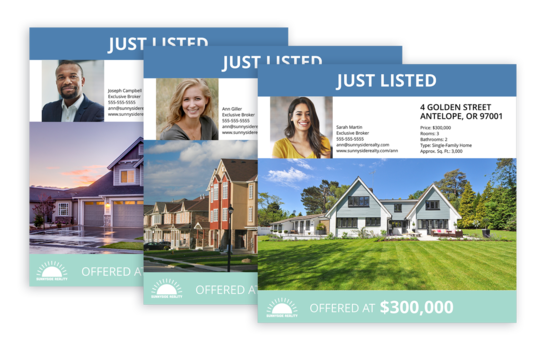 Advertising your brokerage by mail has never been easier. 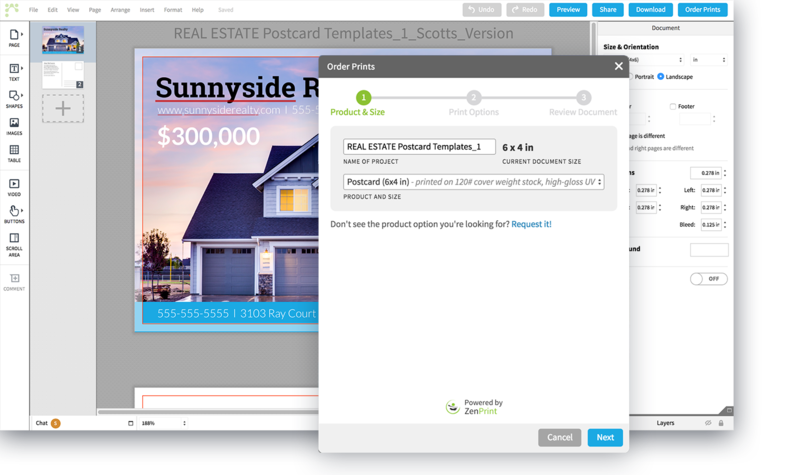 Send postcards, flyers, and invites to multiple addresses at the same time directly within the Lucidpress editor. Plus, use radial search to target prospects by location, age, income, and much more. "The tool we had been using didn't allow for designing, just entering information. It was difficult to use and clunky. Agents would never use it. We love how much easier and more powerful Lucidpress is." "When an agent tells me they need a piece of collateral, I’ll simply log in to Lucidpress, create it, and send the link over to the agent for them to take a look and adjust. Lucidpress speeds up the process a lot. The agents can quickly customize the way they want which is really helpful." "It’s hard to find a product that does as much as this one does as easily as it lets you do it. It's ahead of its time." Satisfy your agents (and your brand) with Lucidpress. 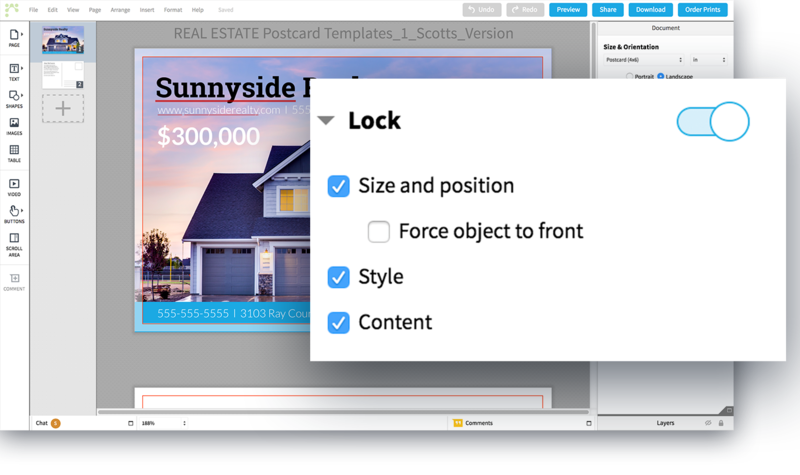 Lock down branded elements of your templates to ensure the brand stays protected after it reaches the hands of agents. 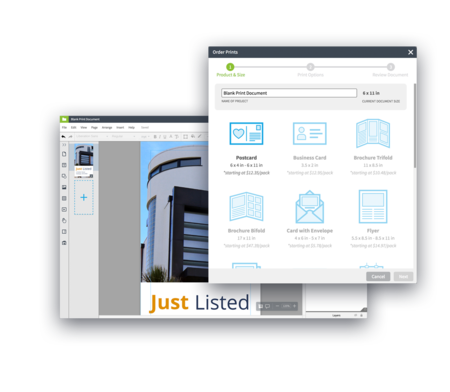 Your brand's logos, images, fonts, and colors can all be stored in the Lucidpress editor for easy access. Define your preferred user permissions, then let agents collaborate on cloud-based templates in real time. They’ll be able to customize marketing collateral themselves without disrupting the brand or requiring the help of a designer. Toggle our Review & Approve feature on and off for added control. Agents can publish digital copies of their documents, share them directly to social media, order prints and even deliver direct mail to clients. This can all be done straight from the Lucidpress editor too.